There are a multitude of VoIP phones that can be used with FreePBX. 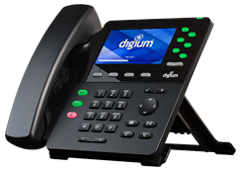 However, one of the best additions to the FreePBX family of support phones are the Digium brand of phones. Digium, as you may already know, is the prime supporter of the Asterisk Telephony Engine that FreePBX runs on. They have developed phones specifically to take advantage of all the features of their commercial version of Asterisk in their Switchvox PBX. FreePBX now has the ability to use these Digium phones natively through the use of the Digium Phone Module for Asterisk (DPMA). While it IS possible to connect Digium phones to any Asterisk-based system through simple web-based configuration of SIP parameters, this requires manual configuration of each phone. Once enabled, DPMA allows automatic configuration of most phone parameters. Historically, provisioning phones has been slightly difficult, because it required a degree of manual configuration of the phone (configuration server for example). Digium phones can search for phone servers on the local subnet using multicast DNS (mDNS). Additionally, the phone has NATIVE applications that can control how the phones interact with the PBX.